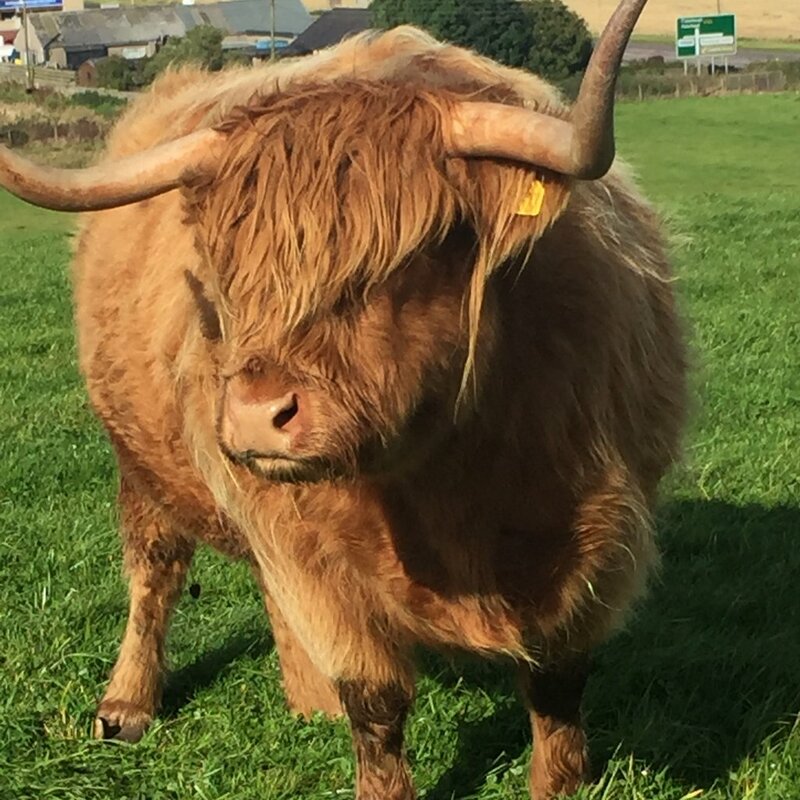 Our Highland Fold started in 2012, when we purchased Leah, Erin and Sorrel, three 1 year old highland Heifers. They were bought for our daughters who actually wanted horses (long story). This was Dads side step to avoid buying horses. The girls loved their calves, grooming, walking, feeding and mucking them out daily. But as the evenings drew in and school work took over, the heifers took second place. This was when, as anticipated, Dad had to step in and look after the trio. In the Summer of 2013 we gave them their freedom, letting them out into a field and fending for themselves. The “girls” enjoyed their time on Aikenshill. 2014 came around we started to talk about increasing our fold, either by introducing a few new calves or moving our original three on and starting again. Everyone loves to see Highlands but the little ones are cute?? On trolling over this for some time, we were offered Connor of Loch Maree as a beau to our ladies. The deal being if we over-wintered him. he would look after our young ladies? This led to us having three mums in calf. 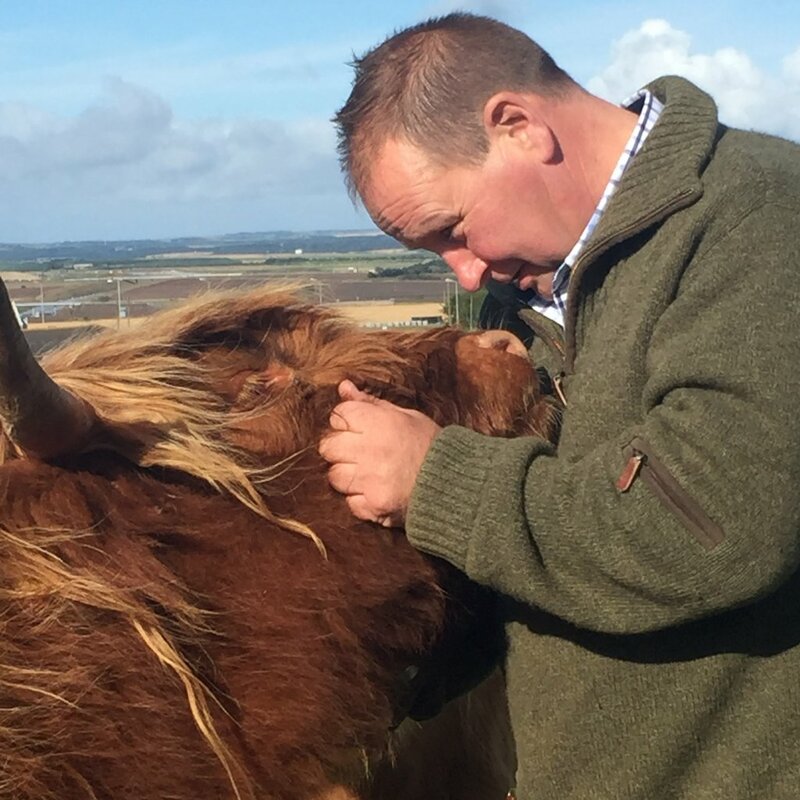 In August 2105, our first calf was born, Sive a wee heifer for Sorrel, an exciting time for us all, as with no experience it was both stressful ensuring all went well and joyous seeing her little ears flick and knowing she was going to be fine. Leah was next, we had a phone call from a neighbour at seven in the morning telling us there seemed to be a new calf in the field. Noe, a bullock, was born. Erin next? She was definitely pregnant, but nothing was happening. After being checked by the Vet a Christmas baby was predicted. Erin went into labour on Boxing day afternoon. It was a wild day, wind from the North and driving rain. It was a long labour, things didn’t go well and probably with my lack of experience, we lost her calf, another heifer, this was most definitely not a good day for both Erin and myself. In 2016, Connor was keeping his side of the bargain, with another 3 calves on their way, Bertus , Sage and Jimmy were born in August , September and November. Sorrel, Sages mum, died just after giving birth to her, a sad moment as we had lost one of our original three. This meant our little orphan had to be bottle fed, another new experience and commitment. Sage became the family pet, walking up to the kitchen door for her morning bottle. On losing Sorrel, we decided to find a replacement. Katie Morag was acquired, a true red head, very quiet when we bought her but showed her true character when she got home. Don’t worry she has quietened down. We trimmed the matts in front of her eyes allowing her to see better, this helps to settle animals as there are no shadows over their eyes (Breeders tip). Again, Connor kept his promise, with three more calves in line for 2017. This is how Aikenshill Highlands started. Now we start to become serious! Part II to follow!